Achieving high-performance in a compact design network connectable controller a single MSEP can operate both the pulse motor and the servo motor type actuators. With direct connection with major field networks including DeviceNet, CC-Link, PROFIBUS-DP, MECHATROLINK, CompoNet, EtherCAT, and EtherNet/IP, the MSEP features 256 positioning points per axis and the ability to verify current position in real-time. 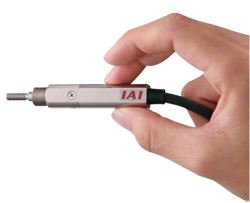 An absolute position encoder is available, which saves the position data by battery, providing prompt operation without returning to the home position after power off. RCP4 Electric cylinder features longer strokes, faster speeds and larger load capacity. When equipped with the new high-performance PowerCON drive controller the RCP4 series has improved maximum speeds of up to 1.5 times over previous models.